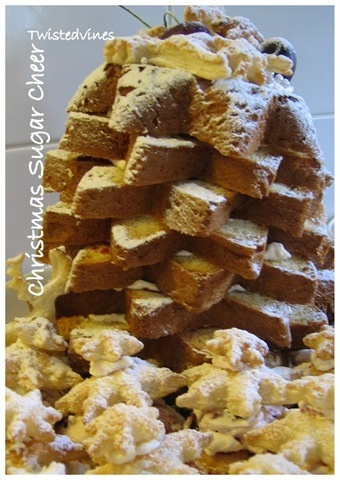 What better way to start the countdown to Christmas than sharing some festive Christmas sugar cheer. Our sugar project; prepare some Christmas treats to see around thirty smiling faces. With so many ‘little’ treats to choose from we short listed some of our favourites, and created a couple of our own. 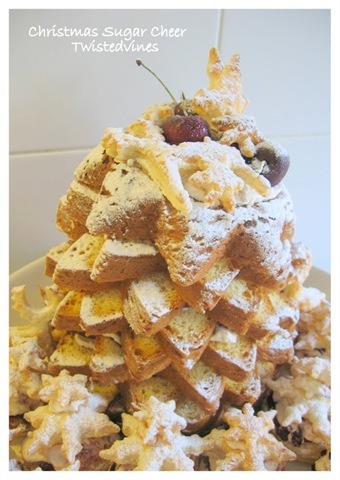 The main feature, a ‘Pandoro’ Christmas Tree. 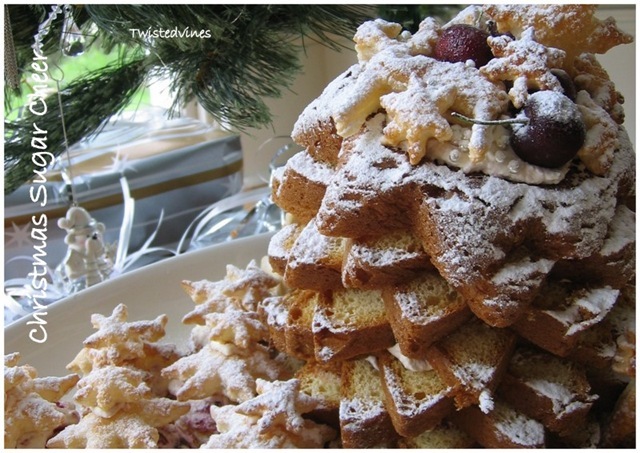 Pandoro (pan d’oro) is a traditional Italian sweet yeast bread most popular around Christmas and New Year . Typically a Veronese (someone or something from Verona, Italy) product, pandoro is traditionally shaped like a frustum with an 8 pointed-star section. Cut crossways it’s shaped like a star, and then layered usually with Chantilly cream, custard or even ice-cream. 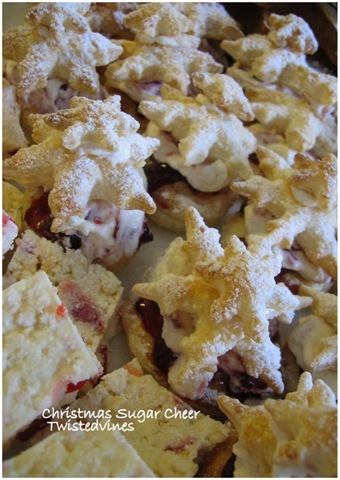 Ours was filled with fresh whipped cream, cherry syrup jam and cherries (tinned). 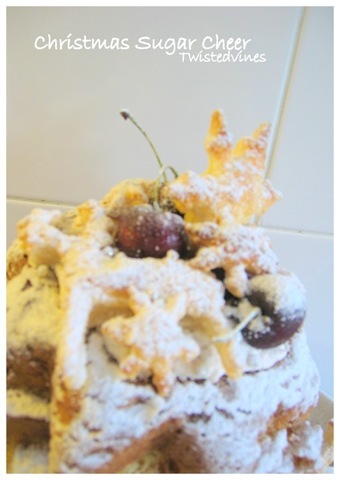 Decorated on top with fresh cherries and puff pastry reindeers and snowflakes sprinkled with icing sugar. These pastries are based on cream horns, see details here. Cutting an oval base and two sizes of puff pastry snowflakes, coated with egg wash and sugar and baked in a moderate oven until golden. Layered with fresh whipped cream and cherry jam. 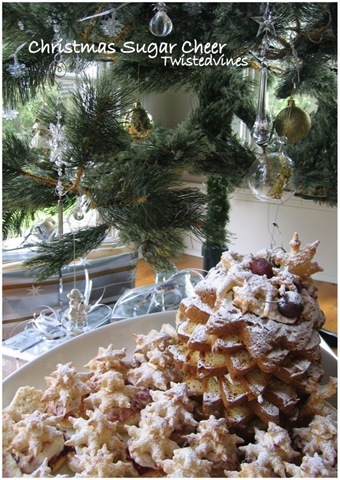 Love sharing the Christmas Sugar Cheer…Happy Baking! It looks delicious! Such a beautiful holiday treat! …the platters were empty and feedback was great. So the Christmas Sugar Cheer was passed on! I didn’t have a try, but know fresh whipped cream and cherries sprinkled with all that icing sugar snow would be a ‘sweet’ treat! Oh, My Goodness! That looks positively gorgeously delicious!…is that a possible thing? The whipped cream looks and sounds sooo good among that star tree sugar wonderland! Sugar lol. I could not feed this to my nieces and nephews.. they would jump off the wall. But I would love to have some of these. You did a wonderful job.. Absolutely delicious to look at. Yvette, sending you warmest wishes for a wonderful festive season.